Artist Tom Sachs says that "Going to the moon was the best art project of the twentieth century." So he made it into an art installation. 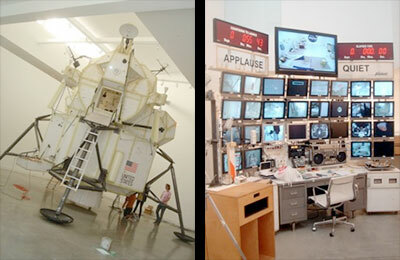 Space Program, on view for another two weeks at the Gagosian Gallery in Beverly Hills, is an incredibly detailed recreation (and reimagination) of a lunar module, control room, astronaut suits, and the moonshot experience. Supertouch also has photos of the installation. Space Program is open through October 13, 2007. "Space Program" is notable because it includes work by other well-known designers. Prada created the lab coats, Nike produced the space boots and Jack Spade designed some of the clothing for Mission Control. "But I would say that NASA is the ultimate status brand," says Sachs. "Everything they make is always of the absolutely highest quality -- because it has to be." For over a decade, Sachs has pondered the technical ingenuity and romance with the unknown that brought America the Apollo program. This publication documents the culmination of his research: the realization of his own life-size Space Program, comprised of three main sculptural elements (Lunar Module, Mission Control, and Space Suit) and a Flight Plan, all put to use during a live demonstration of a lunar landing. In his exuberant manufacture of objects and scenarios, Sachs asks barbed questions of modern creativity that relate to conception, production, consumption, and circulation. Space Program features 797 full-color and 30 black-and-white images; a conversation among Buzz Aldrin, Tom Sachs, and Louise Neri; a critical essay by Arthur C. Danto, contextualizing this work among the artist's contemporaries; and a comprehensive discussion of the work by Mark Van de Walle. These are accompanied by appendices that provide a full visual and descriptive account of the innumerable components that make up Sachs's work and illustrate the artist's related drawings and source materials. Robert Pearlman Tom Sachs has expanded his earlier installation to now occupy the Park Avenue Armory in New York with Space Program: Mars, Wired reports. Step through the doors of the Park Avenue Armory today and you'll join a DIY expedition to Mars that's part hard science, part Capricorn One. With new installation Space Program: Mars, sculptor Tom Sachs and his team of 13 astro-artists have crafted an otherworldly fantasy out of common materials, assembling the components of a space program out of readily available materials bought at hardware stores or salvaged from the streets. The low-tech nature of Sachs' illusionary expedition to the red planet stands in contrast to NASA's state-of-the art space exploration. "Ours is crappy," says Sachs during a press preview of the exhibition Tuesday. "But that's why it's magic." Space Program: Mars, which opens Wednesday, consists of 50 sculptures, five films and countless zines, which took Sachs and his studio hands three years to create. With the sprawling installation, they've attempted to fashion all the life-sustaining gear that would be necessary for humans' colonization and scientific exploration of Mars, from a food-delivery conveyor belt and an astronaut gym to systems for waste disposal and even a Mars rover. Tucked away amid the exhibit's simulated launch and capsule-gathering scenarios, visitors will find a few Sachs staples: a place for his tea ceremony and for a signature Jack Daniel's bottle. But really, Space Program: Mars isn't about space. It's about life on Earth. dfox Saw the exhibit with my daughter yesterday. It is very interesting and very entertaining. It is sort of like a twisted version of Space Camp.